Home/Investigators and Research Centers/Investigators/Nicolás Garrido M.Sc., Ph.D.
Nicolás Garrido Puchalt, Ph.D., M.Sc., is the Director of IVI Foundation, and Director of Research Administration at IVI RMA Global. Dr. Garrido obtained his B.Sc. in Biology from the University of Valencia in 1997, followed by a Post-graduate Research Fellowship at the Department of Gynaecology, Heinrich-Heine University, in Düsseldorf, Germany. He obtained his Doctorate Degree from the University of Valencia in 2001, receiving the Extraordinary Prize in 2002, and a Master’s Degree in Research Methodology: Design and Statistics in Health Sciences from the Universitat Autònoma de Barcelona (UAB) in 2009. He served as the Director of the Andrology Laboratory and Sperm Bank at the IVI University Institute in Valencia from 2000 until 2016, and lead the IVI Teaching Program starting in 2004, and afterwards the IVI Learning Center until 2017. He is an Adjunct Professor at the University of Valencia, heading numerous research projects funded by the local and federal governments. 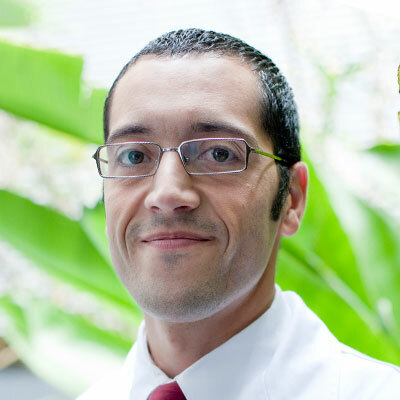 His research interests include male infertility, sperm physiology, sperm selection techniques, biomarkers of fertility, and statistical approaches to measure ART success. He authored or co-authored over 350 abstracts, wrote more than 80 book chapters, and 150 original or review articles in scientific journals. He received the Spanish Fertility Society Award in 2002 and 2004, the Spanish Urology Association Award in 2004, the American Society of Andrology Award (2007, 2010, 2011), and the Salud 2000 Foundation Award in 2010. Dr. Garrido serves as Associate Editor for Fertility and Sterility, and Ad Hoc Reviewer for the Journal of Assisted Reproduction Genetics, Reproductive BioMedicine Online, Human Reproduction, and Reproductive Biology and Endocrinology in the field, among others and as the editor for a textbook on Male Fertility. Sperm lipidic profiles differ significantly between ejaculates resulting in pregnancy or not following intracytoplasmic sperm injection. J Assist Reprod Genet, 35(11):1973-1985, 2018. J Turk Ger Gynecol Assoc, 19(1):48-52, 2018. Luteal Coasting and Individualization of Human Chorionic Gonadotropin Dose after Gonadotropin-Releasing Hormone Agonist Triggering for Final Oocyte Maturation-A Retrospective Proof-of-Concept Study. Front Endocrinol (Lausanne), 9:33-33, 2018. Individual luteolysis pattern after GnRH-agonist trigger for final oocyte maturation. PLoS One. 2017 May 1;12(5):e0176600. doi: 10.1371/journal.pone.0176600. eCollection 2017. Dose of recombinant FSH and estradiol concentration on day of HCG affect embryo development kinetics. Reprod Biomed Online, 25:382-389, 2012. Bleeding during transfer is the only parameter of patient anatomy and embryo quality that affects reproductive outcome: a prospective study. How would revealing the identity of gamete donors affect current practice? Reprod Biomed Online. 10:564-6, 2005. J Assist Reprod Genet 19:443-446, 2002. Follicular hormonal environment and embryo quality in women with endometriosis. Hum Reprod Update, 6:67-74, 2000.